Kambot village lies on the Keram River, a tributary of the lower Sepik. 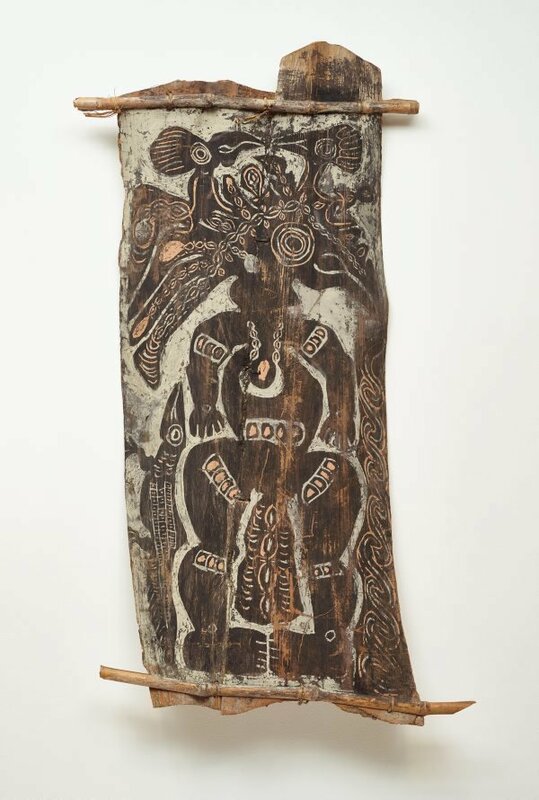 Kambot was first visited by Europeans during a German-led 1912–13 Sepik expedition and its spectacular ceremonial houses featured in the American film 'Jungle islands', shot during the 1928–29 expedition led by Cornelius Vanderbilt Crane for the Field Museum in Chicago. Set high on pilings above the flood plains, the houses' immense overhanging gables – said to resemble the open jaws of a crocodile – were adorned with paintings of spirits from the Kambot pantheon, including the paramount ancestor Mopul. Made from the flattened lower leaf stalks of the sago palm, painted panels – 'panggal' in Pidgin – are sewn together and carefully prepared with a black undercoat. Artists then draw lines with white clay pigment and forms are filled with yellow and orange ochres.